The summer heat is almost over, and soon enough everyone will start thinking about the fall, which for us signals one thing – The Things Conference on Tour in Italy this October. Since it’s happening in Pisa, and we’re the hosts you’ll get a full coverage. Pictures from the workshops, videos, interviews, and more. Or you can buy a ticket, and experience everything with us. The conference will take place on the 11th of October, at the GATE Centre, where our R&D offices are. You should know that the Leaning Tower of Pisa is just five minutes away from the GATE Centre. Whether you’re a history buff or just happy to see the sights, it could be one great snack break from the conference. The Internet Festival is happening in Pisa at the same time (from the 11th until the 14th of October), so there are plenty of things to do and see. Combine a low power, long range, and low bandwidth networking solution with Zerynth Studio and Python, and what do you get? 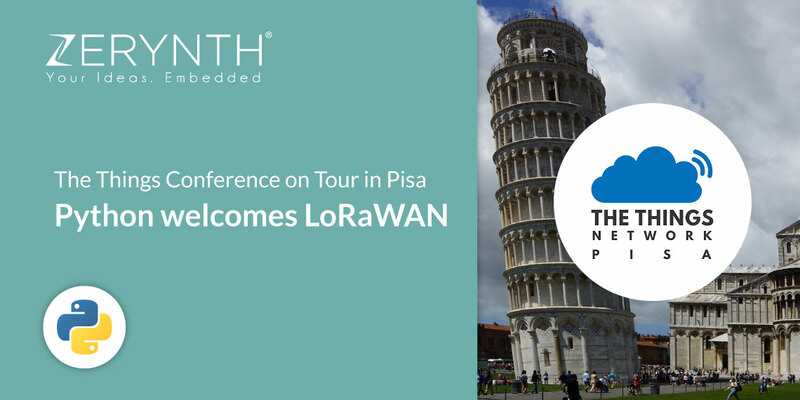 You get LoRAWAN coverage for the whole city of Pisa. You can read all about it here. The Things Network provided the network infrastructure, while the hardware side was covered by MikroElektronika’s LoRa click. Come to Pisa this October for the conference, and you too can explore the possibilities of this long-range wireless network. In February this year, the Zerynth team went to Amsterdam, to participate in the Things Conference. During our workshop, we demonstrated how easy it is to send data over LoRaWAN with just a few lines in Python. And if you are looking to get started with the combination of LoRaWAN and Python yourself, you can take a look at this Zerynth Academy post that explains how to do it. We hope we’ll be seeing you in Pisa this October!